Mr. Cronkite and Mr. Krieger... Sit the hell down and shut up! Let winners do what they do best... which is to win. (This is what you didn’t let them do during the Vietnam War, Mr. Cronkite...) AMERICANS are WINNERS if left along long enough to finish the job! Why is it that every time the road ahead gets rough... you Dems cut tail... and run like hell!!!”? 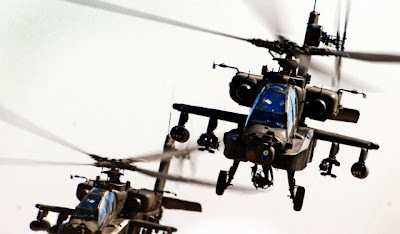 Soldiers flying Apache helicopters come in for a landing at Camp Taji, Iraq, after completing a reconnaissance mission over Baghdad, November 19, 2007. 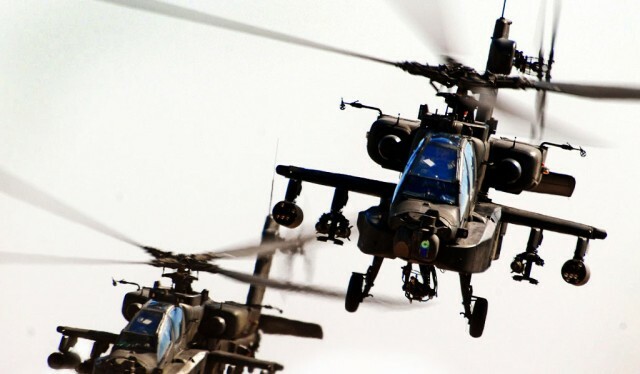 The pilots are from 1st Cavalry Division, 1st Cavalry Brigade, 1st "Attack" Battalion, 227th Aviation Regiment. Both were U.S. Air Force. Cornelius was buried with full military honors on Novmber 10th in Moore, Texas, and Woods' burial is being set by his family. Paraphrasing Bin Laden: "The Afghans didn't do 9/11 so leave them alone; it was my idea"
Bill Amos has details and Allahpundit has some crow for Murtha to eat. Acting on credible intelligence from several sources, International Security Assistance Forces conducted an air strike using precision munitions killing a number of insurgents in the Nurgaram District of Nuristan Province on Nov. 26. The intelligence indicated that an insurgent leader and his forces were preparing for attacks on Afghan National Security Forces and ISAF elements operating in the area. Allegations have been made that construction workers were killed in the air strike. Afghan government officials, ANP and ISAF forces are conducting a joint investigation at this time. “We take allegations of this kind very seriously and make every effort to minimize the possibility of civilian casualties,” said Brig. Gen. Carlos Branco, ISAF Spokesman. ISAF commanders in Nuristan Province and the provincial governor spoke about the air strike early Tuesday morning. Nuristan governor Tamim Nuristani informed the Provincial Reconstruction Team commander that Abdulla Jan, the Western Nuristan Taliban commander, may have been killed in the air strike. FBI.gov website brings us this report today and it starts off like this... It’s the season for online shopping and spending, and you’ll be glad to know that we’ve stepped up our fight against one of the most serious cyber security threats just in time for the holidays. Sgt. 1st Class John J. Tobiason, 42, of Bloomington, Minn., died November 28th in Baghdad, Iraq, of injuries suffered from an incident that is currently under investigation. He was assigned to the 847th Adjutant General Battalion, 89th Regional Readiness Command, Wichita, Kan.
For more information media may contact the 88th Regional Readiness Command public affairs office, Ft. Snelling, Minn., at (612) 713-3011. Cpl. Allen C. Roberts, 21, of Arcola, Ill., died November 28th from a vehicle accident near Al Asad, Iraq. He was assigned to Marine Attack Squadron 214, Marine Aircraft Group 13, 3rd Marine Aircraft Wing, I Marine Expeditionary Force, Marine Corps Air Station Yuma, Ariz.
Media with questions about this Marine can contact the Yuma public affairs office at (928) 269-3422. Army installation commanders worldwide have been directed to plan for spending scale-backs due to an anticipated budget crunch sparked by governmental wrangling over funding for the war on terrorism, according to an Army news release issued today. In a memorandum dated Nov. 26, Gen. Richard A. Cody, vice chief of staff of the Army, directed all Army commanders and agency directors to begin planning to curtail operations and related expenses that do not directly support warfighters engaged in the global war on terrorism, the release stated. Cody's instructions tell Army commanders and civilian leaders to review all operations and to forward recommendations to cut costs back to him by Dec. 4. "We are only in the prudent planning phase," Cody said in a statement issued today. The Defense Department has instructed all military services to review operational costs at installations as well as to prepare for possible furloughs of government civilian employees. "It is an imperative of the senior Army leadership that our Army, especially while at war, understands the budget process, the decisions being made and any potential impacts on the total Army family." Congress has approved supplemental funding for war operations, but such legislation comes attached with timetables for the withdrawal of U.S. troops from Iraq. President Bush has vowed to veto any such legislation that crosses his desk. Having received no war-supplemental money since the fiscal year began on Oct. 1, the Army has had to use its budgeted operations and maintenance dollars normally employed to organize, train, equip and field forces, as well as to sustain soldiers and their families, to fund war-related operations and activities, according to the Army news release. During a visit to Killeen, Texas, Nov. 26, Defense Secretary Robert M. Gates said federal legislators' failure to quickly pass an emergency funding supplemental bill would derail military gains made against insurgents in Iraq and Afghanistan. Army and Marine Corps members constitute the biggest ground presence in both Afghanistan and Iraq. "Without these funds, Army operations and maintenance funds will be exhausted by mid-February, and similar Marine Corps funds about a month later," Gates told listeners gathered at the municipality's Chamber of Commerce. "We cannot wait until mid-February to figure out how to deal with consequences of these accounts running dry," Gates said. Cody has instructed Army installation chiefs and other leaders to be prepared to minimize operational and maintenance-funded activities that are "not required to protect the life, health and safety of occupants of Army installations, or required to maintain assets vital to the national defense." The Army expects to exhaust all operational and maintenance funds by Feb. 23, even after considering a request from DoD to transfer more than $4 billion from Navy and Air Force personnel accounts and the Army's working capital fund, according to today's Army release. Per current labor agreements and to provide some predictability to the civilian work force, supervisors would have to start notifying Army civilians of any impending February furloughs by mid-December, according to the Army news release. During a Nov. 20 Pentagon news conference, DoD spokesman Geoff Morrell told reporters that Gates lamented that Congress hadn't quickly passed the emergency supplemental bill containing nearly $200 billion to fund war operations. In consequence, Morrell said, Gates directed the Army and Marine Corps to begin planning to reduce operations at all Army bases by mid-February and all Marine installations by mid-March. "At that point, the bases will be all but shut down, able to provide only the most basic safety and security measures for those who reside there," Morrell said. In addition, the Defense Department will begin notifying about 200,000 civilian employees and contractors "we can no longer afford their services and that, absent additional funding, they will be furloughed or temporarily laid off within a matter of weeks," Morrell told reporters. The Army's planning actions "are absolutely necessary given the uncertain global war on terror funding," Cody stated in today's Army news release. "We will do everything we can to minimize the turbulence for our soldiers, civilians and their families." Pakistani President Pervez Musharraf has stepped down as chief of the army in a ceremony transferring power to his hand-picked successor, General Ashfaq Kayani. 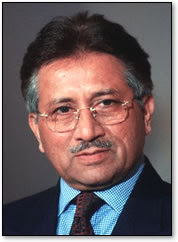 On Thursday, Mr. Musharraf is scheduled to take the oath as a civilian president. The Department of Defense announced today the death of two soldiers who were supporting Operation Iraqi Freedom. They died November 27th in Amerli, Iraq, of wounds suffered when their vehicle encountered an improvised explosive device. They were assigned to the 1st Squadron, 71st Cavalry Regiment, 1st Brigade Combat Team, 10th Mountain Division (Light Infantry), Fort Drum, N.Y.
Pvt. Isaac T. Cortes, 26, of Bronx, N.Y.
Spc. Benjamin J. Garrison, 25, of Houston, Texas. For further information contact the Fort Drum public affairs office, (315) 772-8286, or go to http://www.drum.army.mil/sites/installation/pao/. 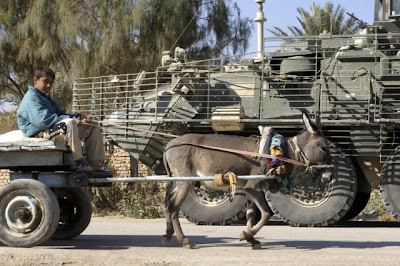 An Iraqi child drives a donkey kart past a U.S. Army Stryker combat vehicle from Foxtrot Company, 52nd Infantry Regiment, 4th Stryker Brigade Combat Team, 2nd Infantry Division during a patrol in Baqubah, Iraq, November 24, 2007. The first reduction in American forces in Iraq is under way, as the 3rd Brigade Combat Team of the 1st Cavalry Division heads back to Fort Hood, Texas. The brigade will not be replaced. Roughly 162,000 U.S. troops are in Iraq in 20 brigade teams or their Marine equivalents. If all goes well, this will drop to 15 brigade combat teams over the next eight months, Navy Rear Adm. Gregory J. Smith, a spokesman for Multinational Force Iraq in Baghdad, said Nov. 24. Iraqi security forces are attaining the expertise and operational capabilities needed to police their own country, Smith said. Iraqi forces are taking over more of the battle space in Baghdad and around the country. "Current conditions allow for a withdrawal of the first unit ... starting on Nov. 27," Smith said. "If conditions continue to permit, a total of five brigade combat teams will be redeployed over the next eight months." The redeployment of the brigade shows the coalition's confidence in Iraqi security forces and reflects the overall improved security in the country, Smith said. The brigade  based in Diyala province  will not leave a vacuum in the province. "We do not intend to give back our hard-fought ground," Smith said. "Repositioning of coalition and Iraqi security forces will ensure that overall force levels and combat capability levels in Diyala will be tailored to meet emerging threats." Soldiers of the 4th Stryker Brigade Combat Team of the 2nd Infantry Division are replacing the 3rd Brigade forces, said Army Col. David W. Sutherland, commander of the 3rd Brigade Combat Team. The Stryker Brigade has been conducting combat operations in other areas of Iraq for the past six months and is absorbing Diyala into its battle space. "Over the past 14 months, my soldiers and the Iraqi security forces, the provincial government and other officials have worked hard to bring stability and services to Diyala," Sutherland said. "And it's truly gratifying to see the efforts of my soldiers come to fruition." The province, while still troubled, has come a long way, he said. The security problem dominated; government, economy and basic services hinged on improved security, he explained. "Public perception of inequity, corruption, and fear became the driving force behind support to terrorists, specifically al Qaeda," the colonel said. In May, prior to Operation Arrowhead Ripper and the surge of troops in Diyala, there were 1,051 significant acts of violence, Sutherland said. This included murders, kidnappings and suicide attacks. "Today, the operational environment is drastically improving," he said. "By the end of October, there were 464 significant acts of violence reported. This is a drop of over 50 percent of significant acts in a province the size of Maryland, with over 1.6 million citizens." And the trend continues. Through Nov. 20, there were just over 200 acts of violence this month. "These improvements would not have been possible without the support and cooperation from the local citizens who were tired of the hatred and disgust offered by extremist organizations," he said. "The surge enabled the coalition and Iraqi security forces to dominate the terrain and secure the population. It also helped the government to function properly and begin focusing on reconstruction and essential services." But in the end, it was the people of the province who enabled the surge to succeed. Roughly 3,000 concerned local citizens have stood up against al Qaeda, Sutherland said. "They assist the Iraqi police by guarding their own roads and local infrastructure and manning checkpoints throughout the province," he explained. These concerned local citizens also provide coalition and the Iraqi security forces with information about weapons caches, locations of car bombs and house-borne and deep-buried improvised explosive devices, and are turning in known al Qaeda fighters. "These concerned local citizens understand that the future of Iraq can be better if they get involved in ridding the province of al Qaeda and participate in the development of their own democracy," he said. "As I've said on numerous occasions, we cannot kill our way out of this," Sutherland said. "In Diyala, when the government loses its will, the people lose hope and they turn to other sources to provide that hope. Today, there is hope in Diyala." Capt. Stephen A. Rusch, U.S. Air Force, of Lambertville, N.J. He will be buried on November 30th at Arlington National Cemetery near Washington, D.C.
On March 7, 1972, Rusch was the weapons systems officer in an F-4E Phantom II aircraft attacking enemy targets in Salavan Province, Laos. The plane was the number two aircraft in a flight of two. When Rusch's aircraft was cleared to begin its second run over enemy targets, the flight leader of the number one aircraft lost sight of Rusch's plane and observed enemy ground fire followed by a large explosion. An immediate search was begun, but all attempts to establish radio contact and later search efforts were unsuccessful. In 1995, a joint U.S./Lao People's Democratic Republic (L.P.D.R.) team, led by the Joint POW/MIA Accounting Command (JPAC), investigated the incident and interviewed several Laotian citizens. The team surveyed the crash site identified by one of the citizens and found aircraft wreckage. 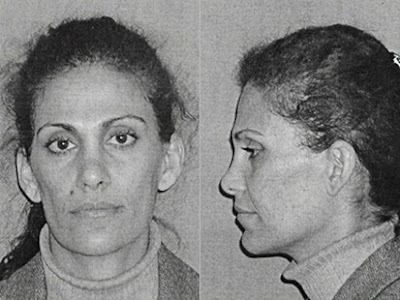 In 2001, a U.S. citizen, acting as an intermediary for a Laotian citizen, turned over to U.S. officials a bone fragment and a photocopy of Rusch's military identification tag. The bone fragment proved not to be from Capt. Rusch. In 2002-2003, joint teams conducted two excavations of the crash site. The teams recovered human remains and non-biological evidence including U.S. coins and life support equipment. 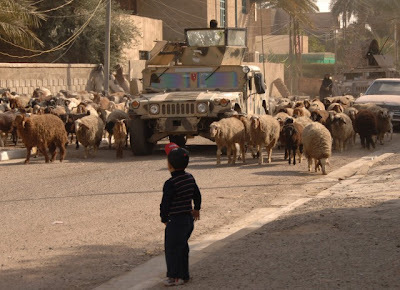 An Iraqi boy watches as a herd of sheep and goats pass by a patrol of U.S. Army Soldiers from Alpha Company, 1st Battalion, 64th Armor Regiment, 2nd Brigade Combat Team, 3rd Infantry Division in Adl, Iraq, Nov. 21, 2007. Staff Sgt. Jonathon L. Martin, 33, of Bellevue, Ohio, died November 22nd in Regensburg, Germany, of wounds suffered on November 9th in Jisr Naft, Iraq, when his vehicle encountered an improvised explosive device. He was assigned to the 1st Squadron, 32nd Cavalry Regiment, 1st Brigade Combat Team, 101st Airborne Division (Air Assault), Fort Campbell, Kentucky. For more information media may contact the Fort Campbell public affairs office at (270) 793-9966. About photo: Soldiers from Co. B, 1-30th Inf. Regt., 2nd BCT, 3rd Inf. Div. drive a brand new Mine Resistant and Ambush Protected (MRAP) vehicle through an off-road confidence course at Camp Liberty. 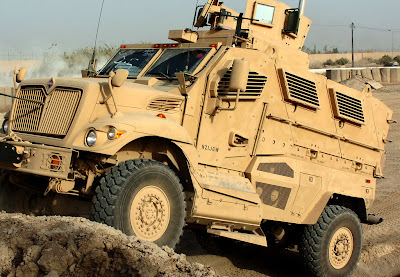 The 1-30th is the first Task Force Marne unit to receive MRAPs. 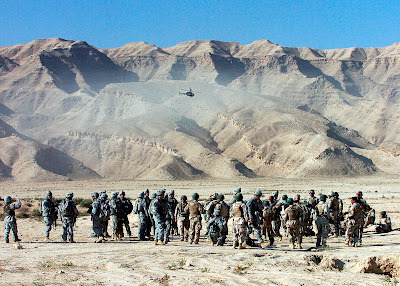 1st Brigade Combat Team, 101st Airborne Division Soldiers, along with Soldiers from the 4th Iraqi Army Division prepare to extract from an objective along the Hamrin Mountain Range during Operation Bulldog Hammer. Spc. Melvin L. Henley Jr., 26, of Jackson, Miss., died at Camp Striker in Baghdad on November 21st of injuries suffered from non-combat related incident. He was assigned to the 603rd Aviation Support Battalion, 3rd Combat Aviation Brigade, 3rd Infantry Division, Fort Stewart, Ga. The incident is under investigation. Sgt. Alfred G. Paredez Jr., 32, of Las Vegas, Nev., died November 20th in Baghdad, Iraq, of wounds suffered when his vehicle struck an improvised explosive device. He was assigned to the 1st Battalion, 8th Cavalry Regiment, 2nd Brigade Combat Team, 1st Cavalry Division, Fort Hood, Texas. a quiet and safe Thanksgiving. Determined to rise up against al-Qaeda terrorists, Concerned Local Citizens, working together with Coalition Forces, have recently started neighborhood watch programs in the area of Kirkuk in northern Iraq. The neighborhood watch programs were first established Nov.14, just two weeks after local citizens approached Soldiers of the 1-19th Mountain Division’s 1st Battalion, 87th Infantry Regiment with the idea. More than 1,000 citizens showed up, ready to be recruited to take up arms in defense against the terrorists in the region. The program provides the CLCs with weapons and a regular paycheck and has the goal of not only providing employment, but improving security throughout the region. “This is the biggest thing going on (for the local Iraqis) … because one, it’s putting money in their pockets and stimulating the local economy, and two, these people really want to provide their own security,” said Maj. John Allen, 1-87 Inf. operations officer. These newly-drafted members of the local Multaka Night Watch, as they are also known, will take to the streets as sentinels against terrorist activity while receiving salaries based on the effectiveness of their performance. For example, for every IED attack that occurs in their neighborhood, a certain amount of money will be withheld from that pay-period as a penalty. While consistent periods of tranquility will be rewarded with bonuses. As a result, Coalition and Iraqi Forces benefit from the increased freedom of maneuver provided by the CLC groups allowing them to more effectively seek out and eliminate the terrorist threat, continued Finnie, also noting that many recruits appeared quite enthusiastic. “It was good to see regular people showing up in street clothes taking pride in their own area so they can stand on their own feet, and provide their own security instead of relying on us to do it for them,” said Cpl. Evan Siegrist, 1-87 Inf. Personal Security Detachment squad leader. Such a show of force by Iraqi citizens willing to confront terrorists sends a message to insurgents that their destructive influence among the population will no longer be tolerated. “Al Qaeda in Iraq is threatened by the Sahwa,” said Allen as he described immediate intelligence reports of disrupted terrorist movements due to CLC activity. The success of this initial recruitment effort marks the beginning of a two week-long initiative to enlist volunteers for the program throughout the 1-87 Inf. Battalion’s area of operation. From press release #07-01-03P - HEADQUARTERS UNITED STATES CENTRAL COMMAND - 7115 South Boundary Boulevard - MacDill AFB, Fla. The Department of Defense POW/Missing Personnel Office announced today that the remains of a U.S. serviceman, missing from the Korean War, have been identified. Sgt. Agostino Di Rienzo, U.S. Army, of East Boston, Mass. Representatives from the Army met with Di Rienzo's next-of-kin to explain the recovery and identification process on behalf of the Secretary of the Army. Di Rienzo was assigned to Company L, 3rd Battalion, 8th Cavalry Regiment, 1st Cavalry Division then occupying a defensive position near Unsan, North Korea, in an area known as the "Camel's Head." On November 1, 1950, parts of two Chinese Communist Forces divisions struck the 1st Cavalry Division's lines, collapsing the perimeter and forcing a withdrawal. In the process, the 3rd Battalion was surrounded and effectively ceased to exist as a fighting unit. Di Rienzo was one of the more than 350 servicemen unaccounted-for from the battle at Unsan. In 2002, a joint U.S.-Democratic People's Republic of North Korea team, led by the Joint POW/MIA Accounting Command (JPAC), excavated a burial site south of Unsan near the nose of the "Camel's Head" formed by the joining of the Nammyon and Kuryong rivers. The team recovered human remains. 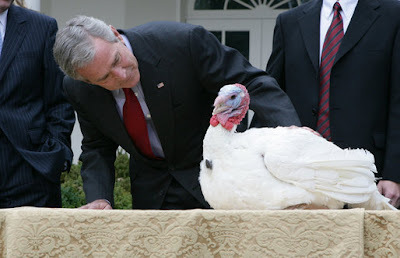 President George W. Bush offers an official pardon to May, the 2007 Thanksgiving Turkey, during festivities Tuesday, November 20, 2007, in the Rose Garden of the White House. In pardoning May, and the alternate, Flower, the President said, "May they live the rest of their lives in blissful gobbling. And may all Americans enjoy a holiday full of love and peace. God bless you all." Monday, November 26:'The Factor' travels to Afghanistan and Bill meets with and interviews the troops at Bagram Air Base. Don't miss... [their] special report. Baghdad troops captured two individuals believed to be part of a terrorist cell and a cache of explosively formed penetrators, rockets and other munitions in southern Baghdad Nov. 17. Soldiers from Company A, 1st Battalion, 28th Infantry Regiment “Black Lions,” 4th Infantry Brigade Combat Team, 1st Infantry Division, conducted the successful operation after several individuals were observed fleeing from a suspected point of origin of a rocket attack in the Aamel neighborhood of West Rashid. They were tracked to a house and immediately detained. A subsequent search of the building revealed the sizeable cache. Confiscated by troops assigned to Attack Company were six complete EFPs, three 107mm Iranian-made rockets, more than 30 mortar rounds of various calibers, 12 57mm projectiles and other explosives and bomb-making materials. The suspects are being held for further questioning. Soldiers assigned to the 4th Battalion, 64th Armored Regiment “Tuskers,” working closely with Iraqi Security Volunteers in the Saydiyah neighborhood of West Rashid, seized four separate caches of weapons and explosives after receiving tips from area resident Nov. 18. The troops seized a complete 82mm mortar system, more than 40 pounds of homemade explosives and several AK-47 assault rifles and pistols. The Department of Defense announced today the death of three soldiers who were supporting Operation Iraqi Freedom. They died November 18th when an improvised explosive device detonated during a mounted patrol in Baquabah, Iraq. They were assigned to the 1st Battalion, 38th Infantry Regiment, 4th Stryker Brigade Combat Team, 2nd Infantry Division, Fort Lewis, Wash.
Pfc. Marius L. Ferrero, 23, of Miami, Fla., who died in Baqubah, Iraq. Cpl. Jason T. Lee, 26, of Fruitport, Mich., who died in Balad, Iraq. Cpl. Christopher J. Nelson, 22, Rochester, Wash., who died in Baqubah, Iraq. 2nd Lt. Peter H. Burks, 26, of Dallas, Texas, died November 14th in Baghdad, Iraq, of wounds suffered when his vehicle struck an improvised explosive device. He was assigned to the 4th Squadron, 2nd Stryker Cavalry Regiment, Vilseck, Germany. For more information media may contact the U.S. Army Europe public affairs office at 011-49-6221-57-5816/8694. Staff Sgt. Alejandro Ayala, 26, of Riverside, Calif., died November 18th of injuries sustained as a result of a vehicle accident in Kuwait. He was assigned to the 90th Logistics Readiness Squadron, F.E. Warren Air Force Base, Wyo. The cause of the accident is under investigation. For further information related to this release, please contact the F.E. Warren Air Force Base public affairs office at (307) 773-3362. Sgt. Steven C. Ganczewski, 22, of Niagara Falls, N.Y., died November 16th, in Balad, Iraq, [of] wounds suffered from a combat-related incident. The incident is under investigation. He was assigned to the 3rd Battalion, 75th Ranger Regiment, Fort Benning, Ga.
For more information related to this release, the media may contact the Fort Benning public affairs office at (706) 545-3512, or after hours at (706) 545-2218. Sgt. Mason L. Lewis, 26, of Gloucester, Va., died in Baghdad on November 16th, as a result of a non-combat related training accident. He was assigned to the 26th Brigade Support Battalion, 2nd Brigade Combat Team, 3rd Infantry Division, Fort Stewart, Ga. The incident is under investigation. Sgt. Kenneth R. Booker, 25, of Vevay, Ind., died November 14th, in Mukhisa, Iraq, of wounds sustained when an improvised explosive device detonated near his vehicle. He was assigned to the 2nd Battalion, 23rd Infantry Regiment, 4th Stryker Brigade Combat Team, 2nd Infantry Division, Fort Lewis, Wash.
For more information, media may contact the Fort Lewis public affairs office at (253) 967-0152, (253) 967-0147 or after hours at (253) 967-0015 (ask for the Public Affairs Officer on call). A former member of an extremist group led Coalition Forces, Iraqi Army and Concerned Local Citizens to a cache site near southeast of Baghdad in the morning hours, Nov. 13. The citizen, who reconciled with Iraqi and Coalition troops, knew where the cache was because he helped bury it sometime ago. He said he is now helping Coalition Forces because he is tired of al-Qaeda trying to force him to work with them. He said al-Qaeda imprisoned him and tortured his friends for not joining forces with them. The Soldiers from Battery B, 1st Battalion, 9th Field Artillery, 2nd Brigade Combat Team, 3rd Infantry Division, and IA found refrigerators that contained numerous rockets, mortars and ammunition. Finding and destroying a weapons cache of this size will help slow enemy attacks in the area, said Capt. David Underwood, Battery B, 1-9th FA commander. He added that the find boosted the troops’ morale. About Video: (Mature) Enemy combatants launched a mortar attack against Balad Air Base recently and quickly received counter fire. Killer Cold Virus Spreading in U.S.
2nd Lt. Stuart F. Liles, 26, of Hot Springs, Ark., died November 13h in Bagram, Afghanistan, of injuries suffered in a non-combat related incident. He was assigned to the 122nd Aviation Support Battalion, 82nd Combat Aviation Brigade, 82nd Airborne Division, Fort Bragg, N.C. The incident is under investigation. Spc. Ashley Sietsema, 20, of Melrose Park, Ill., died November 12th in Kuwait City, Kuwait, of injuries suffered in a vehicle accident. 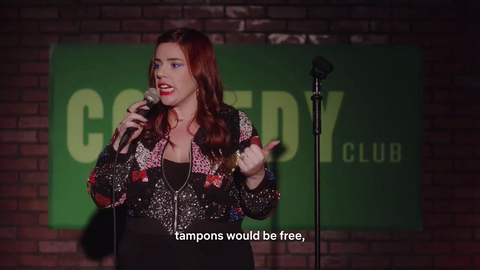 She was assigned to the 708th Medical Company, 108th Medical Battalion, 108th Sustainment Brigade, Illinois National Guard, North Riverside, Ill. The incident is under investigation. For more information media may contact the Illinois National Guard public affairs office at (217) 761-3569. The Dems need to stop worrying about President Bush and start worrying about being BULLIED by the far left such as the Code Pink NUTS! DO NOT PLAY CHICKEN politics WITH THE LIVES OF OUR FIGHTING MEN AND WOMEN OF THE U.S. ARMED FORCES!!! There is no "wiggle room" in the Defense Department budget, and Congress must pass the emergency supplemental spending bill as soon as possible to avoid halting operations and furloughing civilian employees, Defense Secretary Robert M. Gates said today. During a Pentagon news conference, Gates reinforced the message he delivered to Congress yesterday, when he and Secretary of State Condoleezza Rice visited Capitol Hill and briefed members of both houses. 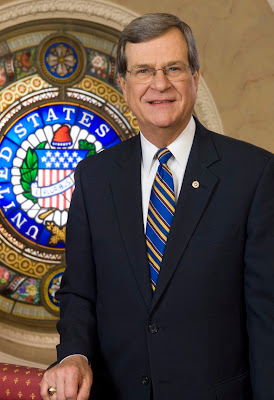 Gates strongly urged Congress to pass a global war on terror funding bill that the president would sign, he said. The secretary said the president's signing of the 2008 National Defense Appropriations Act into law earlier this week caused some misperceptions. One misperception is that the Defense Department can continue funding troops in the field for an indefinite period of time through accounting maneuvers -- "that we can shuffle money around the department." "This is a serious misconception," the secretary said. The Defense Department has significantly less funding flexibility than it had in the spring, he said. In the fall of 2006, Congress provided a bridge fund of $70 billion until passage of the full war supplemental bill, which did not pass until late May 2007. This year, the Defense Department was operating under a continuing resolution. "Now that the regular appropriations bill has been enacted, we are left with no bridge fund and only our base budget to support normal war operations," Gates said. "Further, Congress has provided very limited flexibility to deal with this funding shortage." Restrictions on the budget mean that the department can transfer only $3.7 billion, which amounts to just a little over one week's worth of war expenses, he said. All this leaves the department with only undesirable options to continue operations with the absence of a bridge fund, the secretary said. "The path we believe is least undesirable fiscally and militarily would involve the following: The military would cease operations at all Army bases by mid-February next year," he said. "This would result in the furloughing of about 100,000 government employees and a like number of contractor employees at Army bases. "These layoffs would have a cascading effect on depots and procurement," he continued. "Similar actions would follow for the Marine Corps about a month later." The department must notify certain union employees 60 days in advance of any layoff or furlough, so the department will need to send the notices to affected employees in mid-December. "If the Congress does not provide bridge funding this week on a bill the president will sign, and given the uncertainty of future action in December, by the end of this week -- as a prudent manager -- I will be obliged to take a series of anticipatory steps," Gates said. The secretary said he will submit an urgent reprogramming request for funds to Congress. He also will direct the Army and Marine Corps to develop a plan to furlough employees, terminate contracts and prepare bases for reduced operations. "These plans would begin to be implemented in mid-December," he said. Even if Congress acts, the president signs a bill, and the department receives $50 billion in bridge funding now, this will fund war operations only through about the end of February, Gates said. "So we would be back in this situation immediately after the Congress reconvenes in late January," the secretary said. "The high degree of uncertainty on funding for the war is immensely complicating this task and will have tremendous consequences for this department and the men and women in uniform." Gates said the issue before Congress is not one of principle, but pacing. He said Congress asked the president to draw down the troops in Iraq, set a date for when the drawdowns would begin, set a timetable for the drawdowns and then to transfer the security mission to Iraqis. "The president has moved in all four of these areas: He has announced there will be drawdowns; the drawdowns have already started," Gates said. Army Gen. David H. Petraeus, the commander of Multinational Force Iraq, has announced a timetable at least for the first five brigade combat teams, and the mission of transition begins in December when the first brigade comes out, he said. "What I told members of Congress yesterday, for those who allege that the views of the generals were not sufficiently taken into account at the front end of the war, now you have a recommendation from the commander in the field, the commander of Central Command, from the Joint Chiefs of Staff, on what makes sense in terms of pacing so we don't put at risk the gains we've already made," Gates said. "It seems to me that there ought to be some deference to those who are running the war -- the generals -- at the pace at which this drawdown should take place," the secretary said. "However one feels about how we've got to this point, the reality is we have had some significant success due to the efforts of our men and women in uniform and their sacrifices. "We don't want to sacrifice their success," he continued. "So how do we get the next phase of this conflict right? Because the consequences of getting it wrong are potentially high." The Department of Defense announced today the death of two soldiers who were supporting Operation Enduring Freedom. They died November 12th in Bermel, Afghanistan, of wounds suffered when the vehicle they were in was struck by an improvised explosive device. They were assigned to 1st Squadron, 91st Cavalry Regiment, 173rd Airborne Brigade Combat Team, Schweinfurt, Germany. Spc. Derek R. Banks, 24, of Newport News, Va., died November 14th in San Antonio of wounds suffered October 25th in Baghdad, Iraq, when the vehicle he was in struck an improvised explosive device. He was assigned to the 237th Engineer Company, 276th Engineer Battalion, 91st Troop Command, Virginia National Guard, West Point, Va.
For more information media may contact the Virginia National Guard public affairs office at (434) 298-6107. Pfc. Casey P. Mason, 22, of Lake, Mich., died November 13th in Mosul, Iraq of wounds suffered when enemy forces attacked his unit using small arms fire. He was assigned to the 728th Military Police Battalion, 8th Military Police Brigade, 8th Theater Sustainment Command, Schofield Barracks, Hawaii. For more information, media should contact 8th Theater Sustainment Command public affairs office, (808) 438-1000. Coalition forces killed 25 suspected terrorists and detained 21 suspects, four of whom were wounded, late Tuesday and early Wednesday during operations targeting senior terrorist leaders in central Iraq. “Al-Qaeda is being hit continually by Iraqi and Coalition Forces, so their networks are disrupted and their manpower pool diminishing, thus limiting their ability to strike innocent Iraqis,” said Maj. Winfield Danielson, MNF-I spokesman. The Department of Defense announced today the death of two soldiers who were supporting Operation Iraqi Freedom. They died November 13th in Mukhisa, Iraq, of wounds suffered when an improvised explosive device detonated during dismounted combat operations. They were assigned to the 2nd Battalion, 23rd Infantry Regiment, 4th Stryker Brigade Combat Team, 2nd Infantry Division, Fort Lewis, Wash.
Sgt. Christopher R. Kruse, 23, of Emporia, Kan.
Spc. Peter W. Schmidt, 30, of Eureka, Calif.
Reid Threatens Funds for Iraq War - AGAIN!!! Will Oil Hit $100 A Barrel?? ?